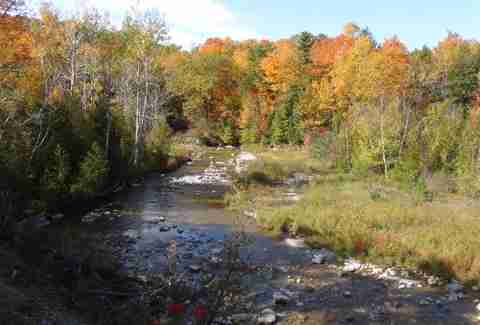 Is this an opportune time to hike in Ontario? The answer is yes, absolutely yes. We’re about to enter six solid months of freezing, dead tundra so now's the time to lace up your hiking boots, jump in the car, and breathe in summer’s last, final exhale. 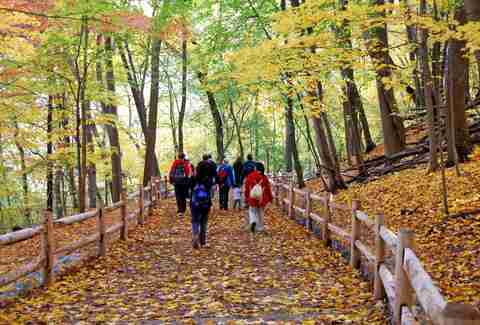 Ontario may not boast the dramatic landscapes of Canada’s Atlantic or Pacific, but between the vibrant, changing leaves, some pretty incredible bluffs, and the City of Waterfalls, there are some solid hiking options in the greater Toronto area. Check out our shortlist of the most picturesque hikes where you can get your nature fix just outside (or inside) the 6ix. 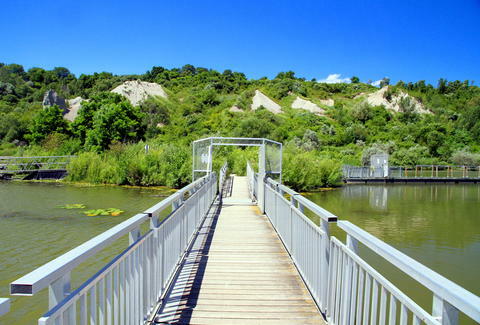 This unique site is more of a gentle walk and biking trail, but it’s in the heart of the city and TTC accessible. The Don Valley Brick Works was a quarry and brick manufacturer for almost 100 years before its closure in 1984; the abandoned site was reinvented as Evergreen Brick Works, a park and community environmental centre complete with a graffiti exhibition, look out point, children’s garden, and an ice skating rink in the winter. Take our final enjoyable days with a picnic on the grounds and a visit to the weekend farmer’s market, which heads indoors on November 14th. 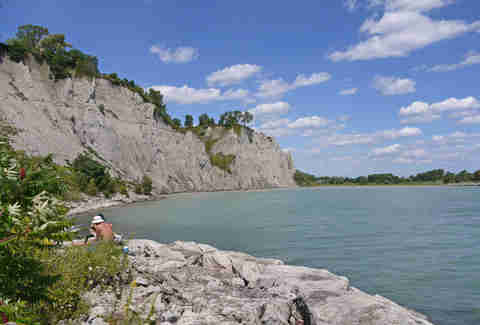 This easy hike will transport you from the shores of Lake Ontario to the white cliffs of Dover -- the Scarborough Bluffs are almost 15km of brilliant white, sheer cliffs, over 25 stories tall at their highest point. We would never encourage you to climb the bluffs for that oh-so-perfect photo op (or would we? ), but definitely wander out further east to skip some of the big weekend crowds. Hit up Cathedral Bluffs Lookout for the panoramic view -- it's one instance of Lake Ontario being a total stunner. Rouge Valley Conservation Centre, within City of Toronto bounds, is the largest urban park in North America. It’s accessible by transit, completely free to enter, canine-friendly, and large enough that you can spend an entire day hiking without even realizing you’re still in the city. There’s even enough wildlife in this urban park to merit an annual Eco Exploration event, and being next to the Toronto Zoo means you can also visit Jia Panpan and Jia Yueyue, the city’s favourite giant panda cubs. 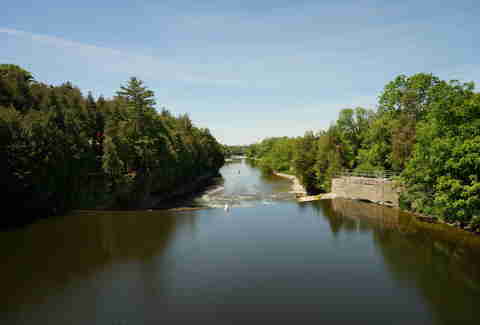 Elora Gorge Conservation Area is home to squiggling hiking trails following the river and overlooking the gorge. Get your inner geologist on and examine bedrock fossils, rocky overhangs known as a Lover’s Leap, and a small but mighty 15-meter waterfall with a 7.5 meter drop into the river. Tired of hiking? Jump in a tube and float the rest of the way -- the Grand River’s rapids are well known amongst both tubers and kayakers. Hamilton isn’t just an insanely popular musical, it’s also an industrial port city commonly referred to as the Armpit of Ontario! Hamilton the city gets a bad rap, but in recent years it’s undergone some much-needed rebranding as the City of Waterfalls. Home to more than 100 waterfalls and cascades, extensive trails give hikers easy access to these stunning fixtures. 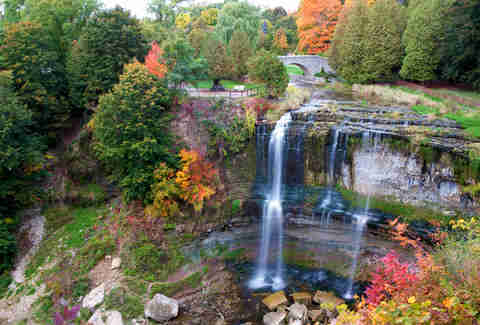 Spencer Gorge Conservation Area is home to Webster Falls, Tew Falls, and the highly-'Grammable Dundas Peak lookout. Get your hiking boots on and do not miss this opportunity to blow up your feed. 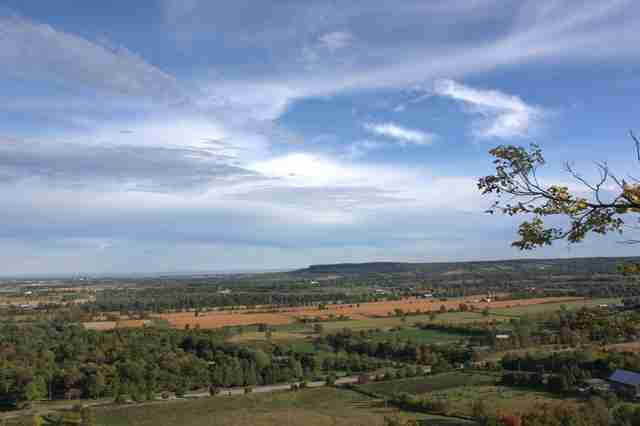 Rattlesnake Point is a favourite among both seasoned and newbie hikers -- there’s something for all skill levels in this stunning forested conservation area. While there aren’t any rattlesnakes, thankfully, there are an abundance of turkey vultures, plenty of vistas for the nature photographers out there, and some amateur rocking climbing opportunities. 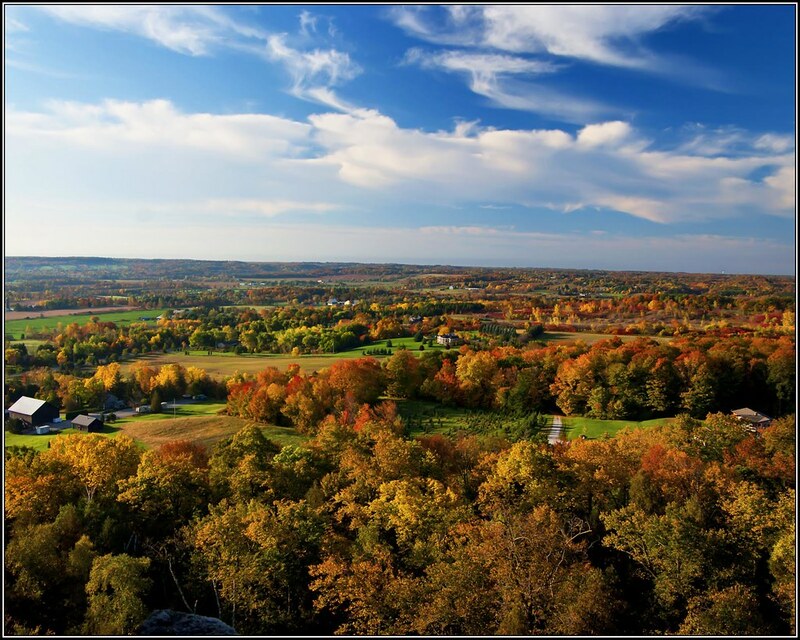 We recommend getting out to Rattlesnake Point in the fall when the colours are changing for the ultimate view. The Bruce Trail spans almost 900km of Southern Ontario, following the Niagara Escarpment, a UNESCO World Biosphere Reserve. This well-marked and -maintained trail explores the diverse landscape of Ontario, from Nottawasaga Bluffs to the Cheltenham Badlands to the great Niagara Falls (... 'cause everyone knows the Canadian side is better). Hike a small section or embark on a more ambitious multi-day hiking and camping adventure; frost bunnies can even cross-country ski sections of the Bruce Trail. See, winter isn't completely useless after all! Sarah Cooper is a Toronto-based writer who recommends that you don’t go chasing waterfalls; please stick to the rivers and the lakes that you’re used to -- unless you’re in the Armpit of Ontario, of course. Catch her on Instagram at @agirlcalledcooper.